I have more pictures to share but I've got kids crawling all over me. Also I'm kinda already in new year mode. I'm sitting on my hands to not pick up, store, put away, take down. My house looks shabby and beat up. It needs a makeover but unfortunately my wallet is also shabby and beat up. I wish there were garage sales in January. I want to buy someone else's stuff to spruce this place up. I'll try to post some photos this week. 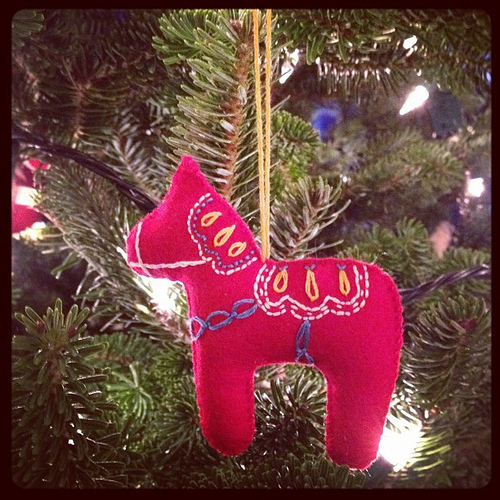 I made one thing I had on my pinterest, the dala horse ornament above (from bhg). Maybe I made more? I'll check. I love this ornament. I’m saving it in my Pinterest for next year. Happy New Year. Thanks so much for posting this! I just love it! Have the Happiest of New Years. I was so disappointed that I got to IKEA too late to get any of the mushroom ornaments.